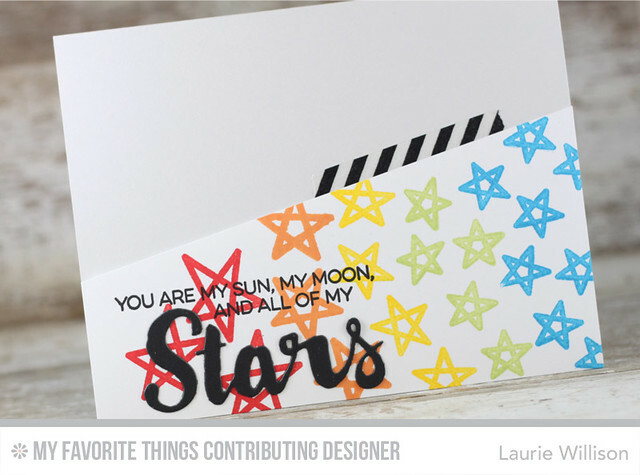 First I stamped the stars, biggest to little...with the different rainbow inks. First the red is Wild Cherry, Orange Fizz, Lemon Drop, Sour Apple and Lush Lagoon. FUN colors! I added in the sentiment in black and the popped the focal point up on foam tape. I added in a little black striped washi behind for some contrast. So that is it for today! I am off to clean like a crazy woman because my crafty, friend Michelle is on her way for dinner! I can't wait for her to get here! I got a package of the new Zig Watercolor Pens about a month ago. I decided it was time to actually try them out. I have to say for a CAS girl....these things work really easy and the colors are amazing! I am not fantastic at this watercoloring thing so don't judge right off. I still look at the background and think it looks a mess but it was fun to play around with these pens. 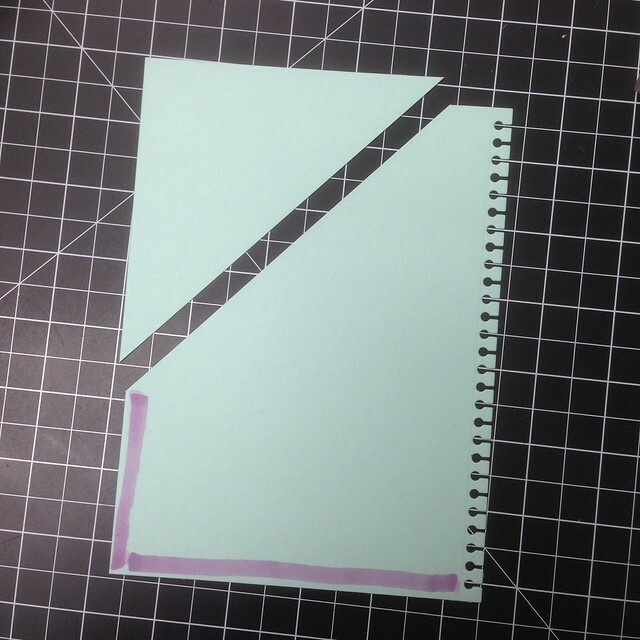 I colored an ombre rectangle on a piece of watercolor paper and went in towards the center space with water. 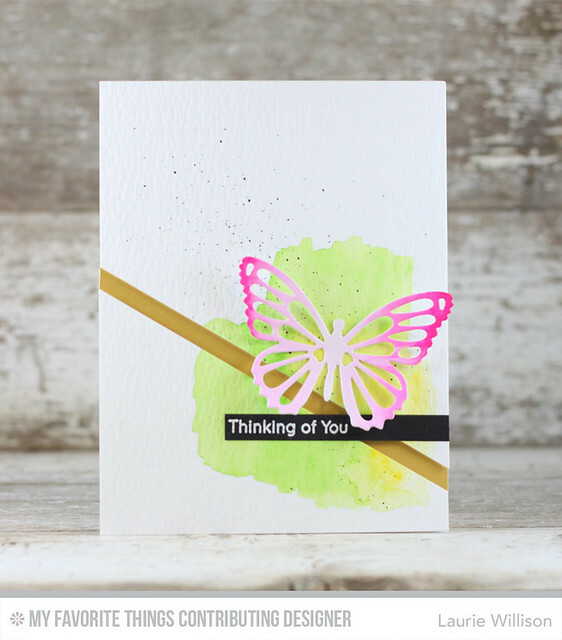 Then I used the butterfly die cut on top to get the fun ombre look. I also added a little Copic spritz in the background to tie in with my black sentiment panel. I also added in a strip of gold card stock behind the card front. These new butterflies dies from My Favorite Things are amazing!! I love the detail. The sentiment is from Somebunny and I heat embossed it on to a little black strip. Hope you are all having a great day! Thanks so much for stopping in! 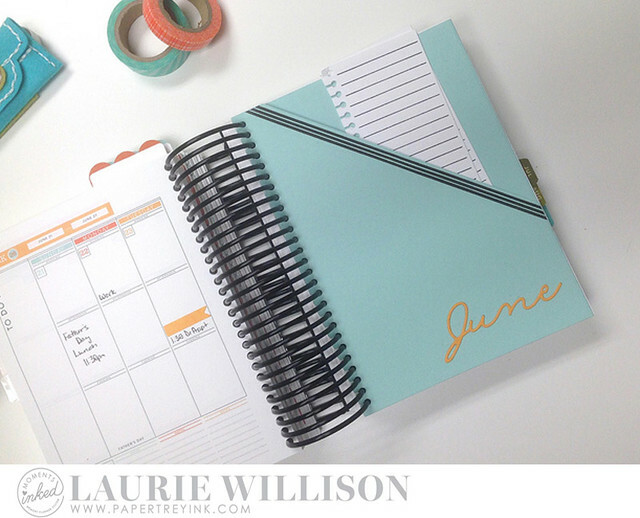 Hi planner friends! 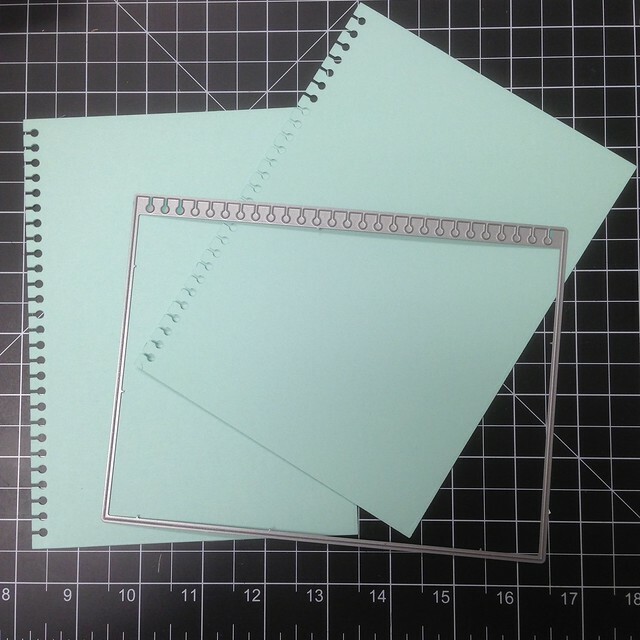 I am stopping in with a super, simple way to get another use out of the large page die. 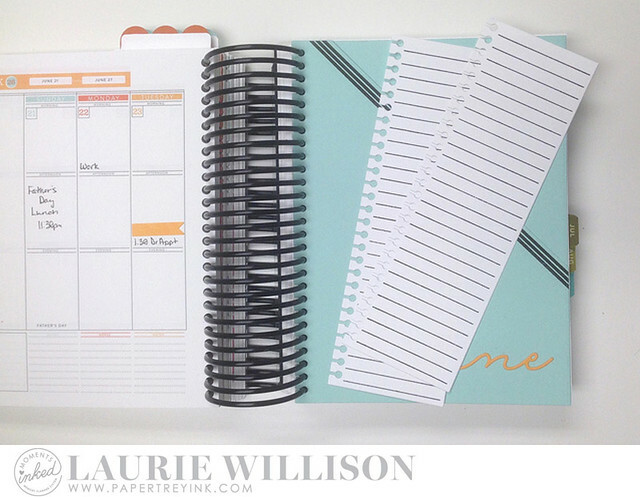 If you are new to my blog or to the Moments Inked Planner System, click here to take you to the Papertrey Ink store, to see all that is available to help get you organized in a creative way! Here is a photo of next weeks layout. I have penciled in a few things and added in this fun new pocket. 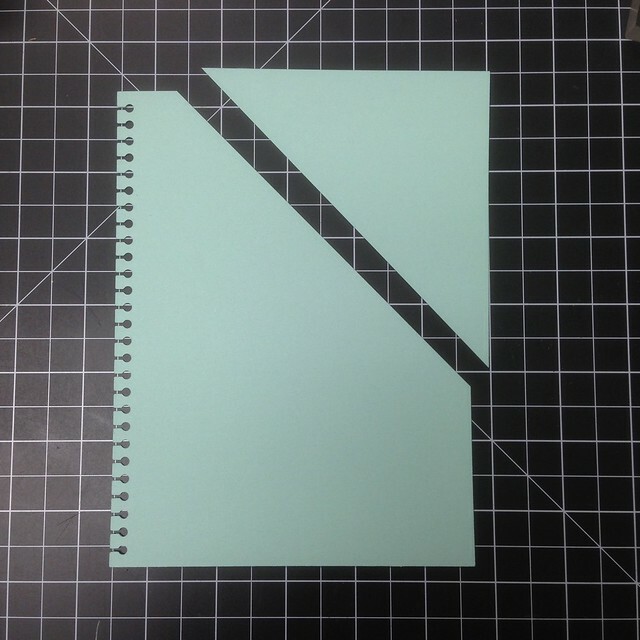 I cut out 2 of the large page dies, from the Moments Inked: Divided Die set, to create a super simple pocket. When you put both pages together, the spiral side is left open. 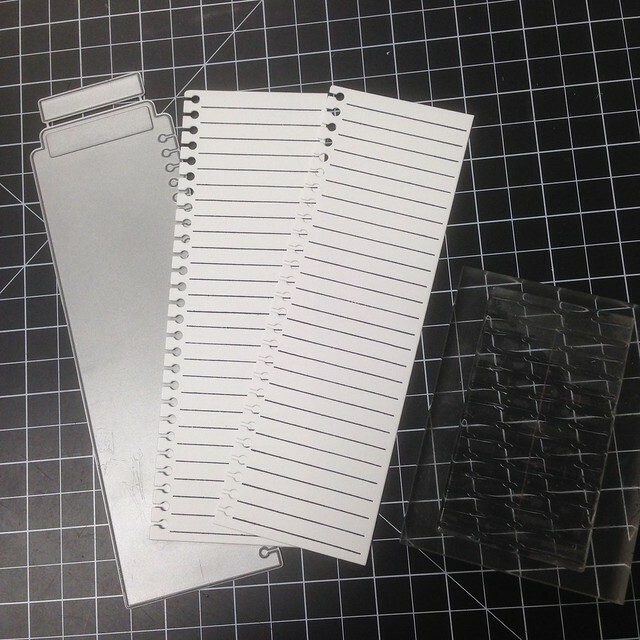 This give you more room in the pocket, because there is no adhesive on that spiral side. Just for some quick and shorter notes, I cut out several of the Tabbed List dies, but cut the tops off of the die. I added in the lines using the Listed Stamp set. 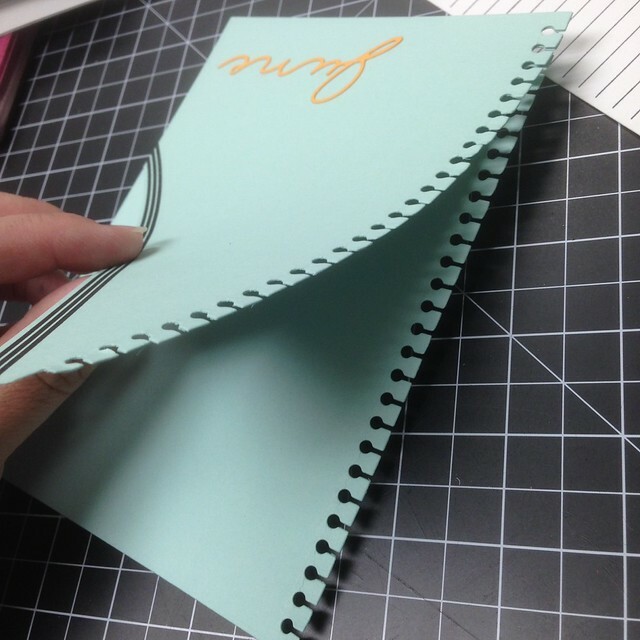 These list work great in the pocket, but can also be added in to your spiral binding. This list stamp set is one of my favorites! To finish off the pocket, I stamped one lined image from Background Basics: Super Stripes. 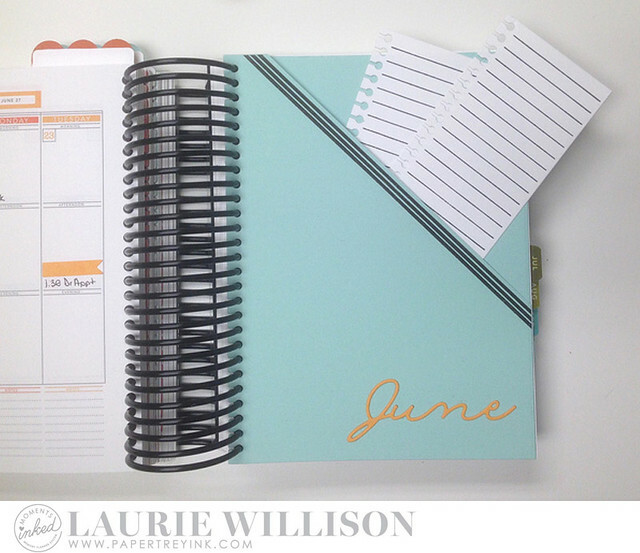 I also added in the "June" word die from the Year Round 1 dies. I chose Summer Sunrise for the color, again to match the June colors. I hope you enjoy this tip. Thanks so much for stopping in today! 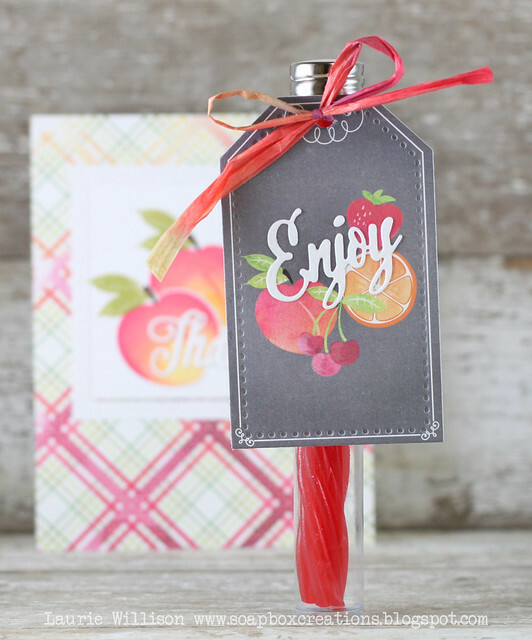 Stopping in with a quick and easy card using some gorgeous new MFT stamps. 2 sets to be exact. I love these sets. 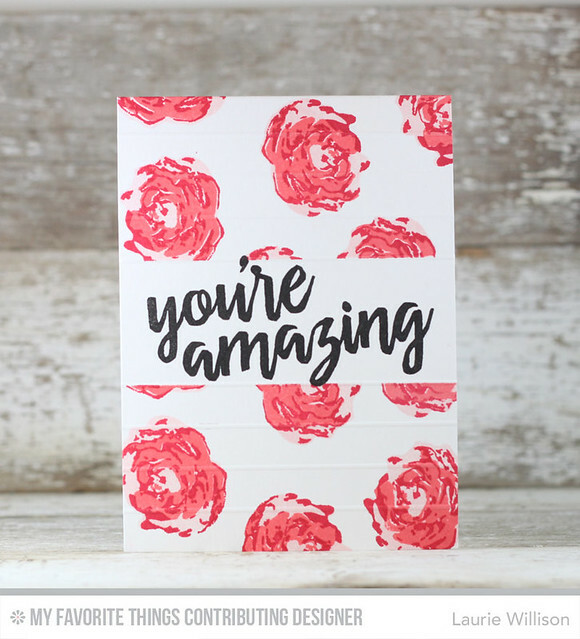 These flowers are so easy to line up and this big bold sentiment is just amazing. hehe! If you can see it, I scored the edge of the white middle area, and then went each way every 1/2". I love the fun little bit of detail it gives. I am currently wading my way through June. June is busy. June is tough. But June has been fun. I just sent my oldest to camp today. For the first time. I may or may not have had to hold back tears. But now my youngest and I are hanging out and having fun! I have some fun stuff planned for him this week and it will be fun to have this time. Enough babbling. I am off to watch some mindless TV for a few minutes before I pass out for the night. This girl is tired. Hope you are all doing well! Thanks for stopping in! Happy release day! Lots of fun stuff, right? I have a few more cards to share and I had so much fun putting these together. 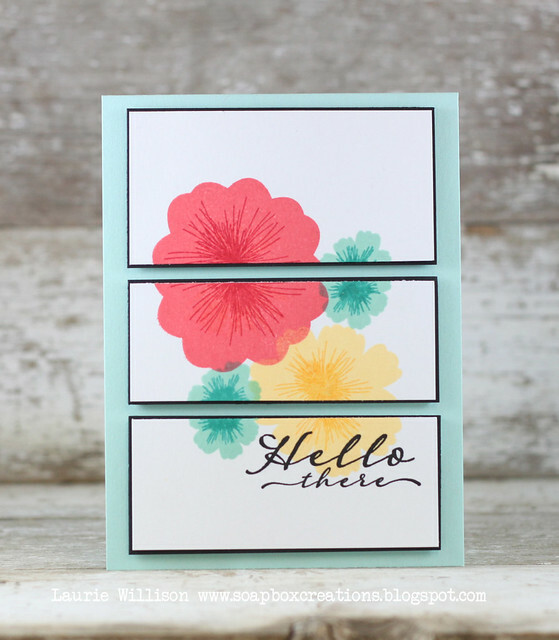 The flowers in this next card are so fun and very easy to put together. Bloomers has lots of different combinations to add in along with dies to make some fun flowers. I added in a sentiment from the set called Scripted to finish it off. Stacked Statements has some adorable detail added in. 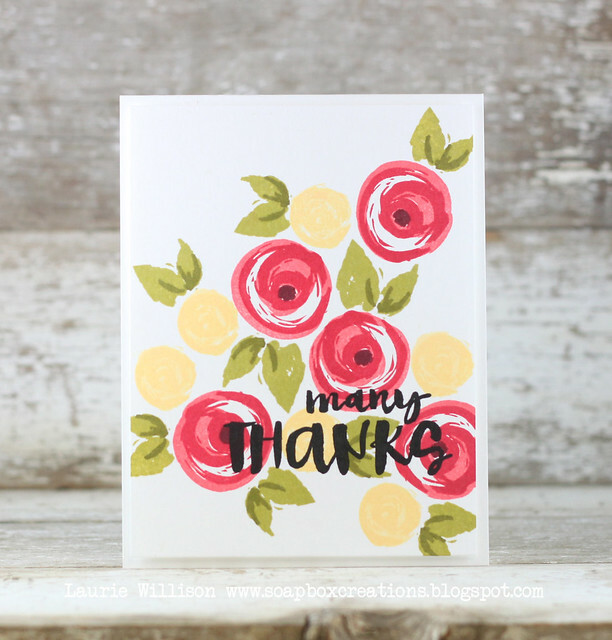 I stamped thanks on the coordinating die and then used some Copics to add in a little color. 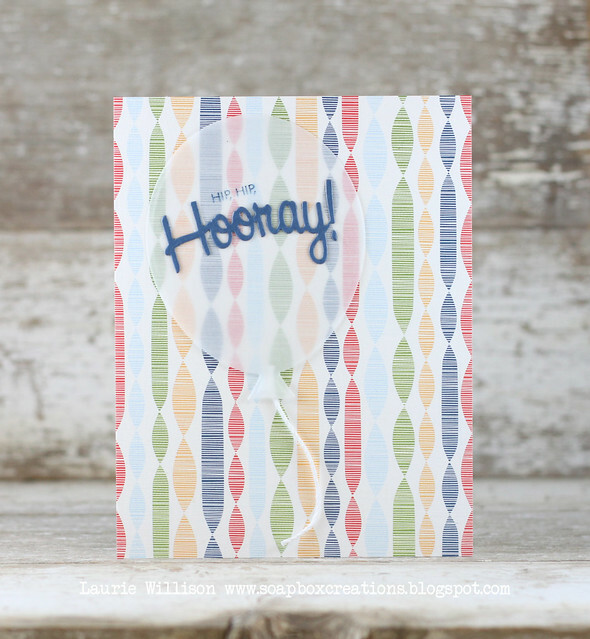 I layered it on a vellum tag, on top of the Cover Plate: Stripes Horizontal die. 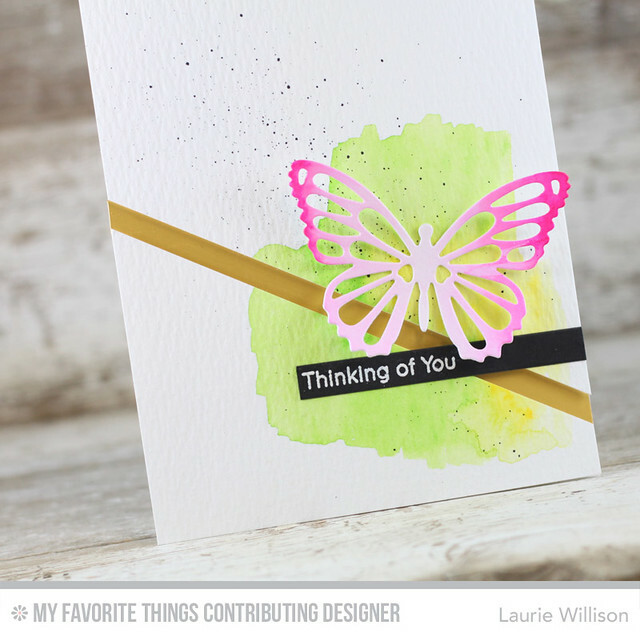 Last, I created a card and matching tag using Still Life: Summer. The fruit images are adorable! 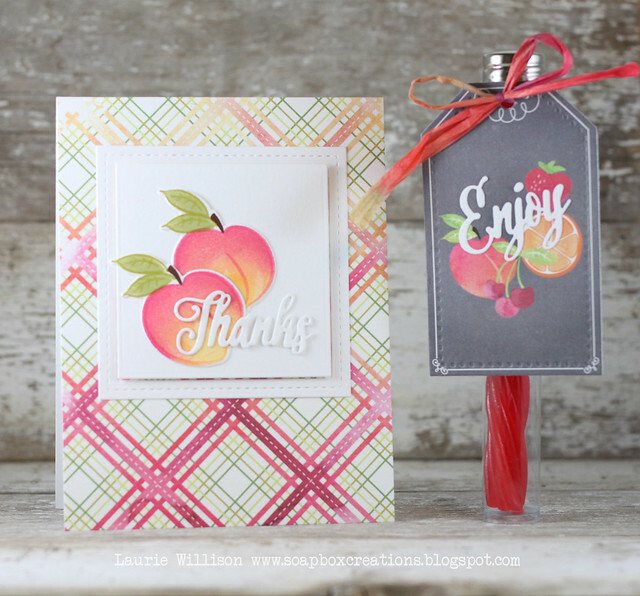 I stamped the peaches and then layered them on a square die cut. I hope you have enjoyed my release projects! I can't wait to hear what your favorite new set is. Let me know in a comment below! To see more, stop over to Nichole's blog. Thanks so much for stopping in! 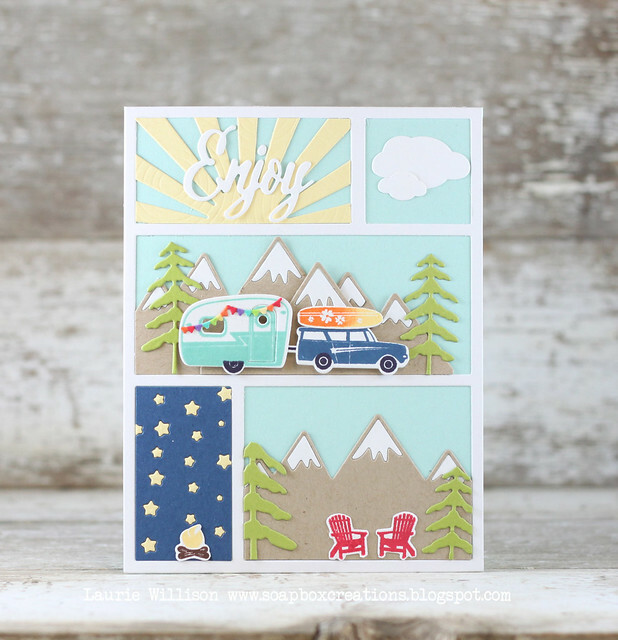 Today is the last group post for the Papertrey Ink release. Have you been loving all the new goodies? 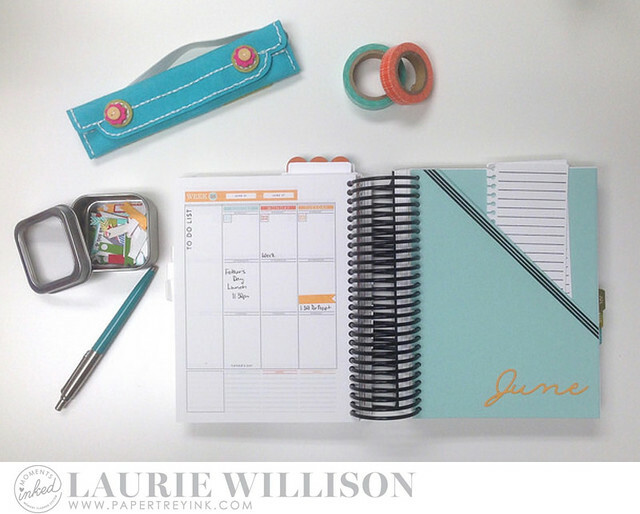 So many fun new things this month! 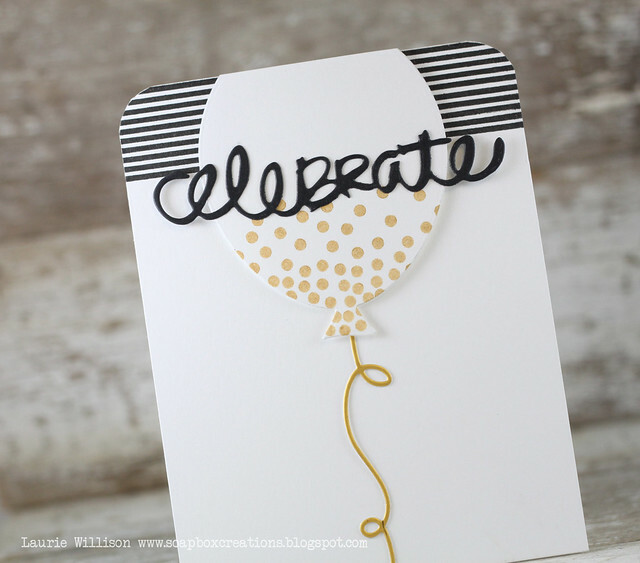 Today we get to share some of the new balloon dies that are available this month. 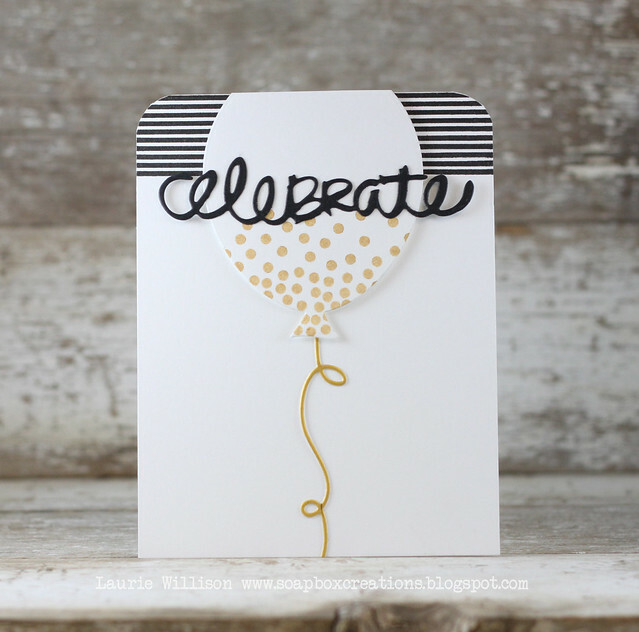 I have 2 cards to share using the solid balloon die from the new Shaker Shapes Balloon. I cut this first balloon out of Vellum and then added in the sentiment in Enchanted Evening ink and card stock. The Hooray is a die from the shaker set, as well. Hip, Hip...comes from the Hooray stamp set. I attached the balloon to a piece of the new paper from the Hooray Paper Collection. 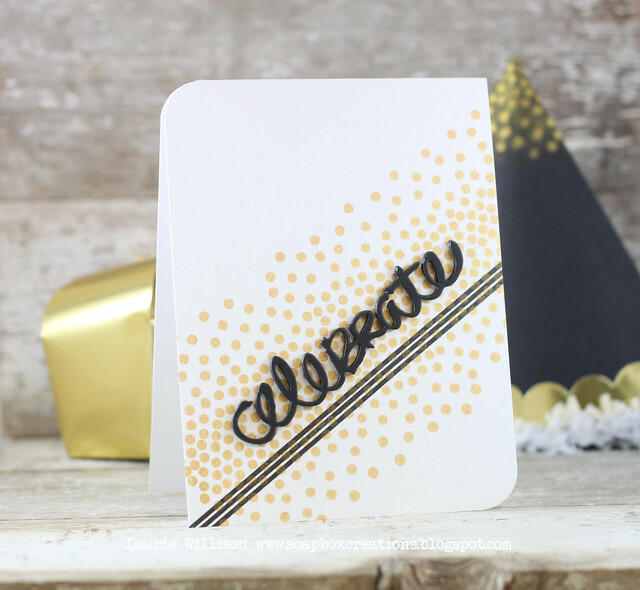 Yesterday's party ensemble had me pretty inspired, so I thought I would make an extra card for today's post using that same color combo of Gold and Black. 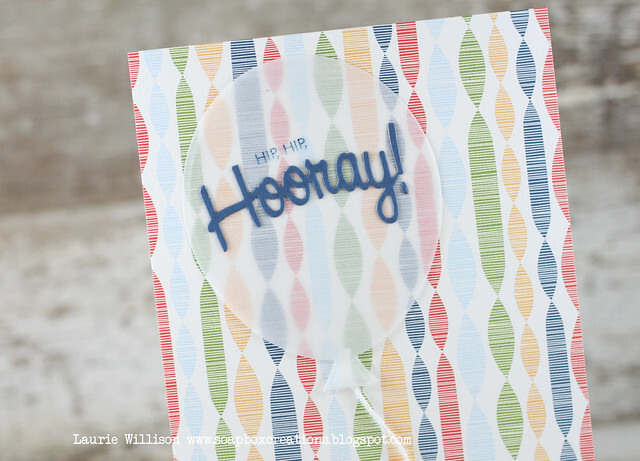 I stamped a couple Background Basics: Super Stripes on the top of the card base. Then I used Good Times to stamp some polkas in Gold on the bottom of the balloon die cut. I added in the black sentiment from the Good Times dies and then a Gold Luxe cardstock, balloon string to finish off the card. I hope you have enjoyed the Group Posts for this week. I have a few more cards to share tomorrow on release day. Do you have a list started? What is your favorite new item this month? Thanks so much for stopping in today! Have a ready day! Since Gold is all the rage, I am seeing Gold and Black parties all over Pinterest. I couldn't just share just one photo because I got my inspiration from so many places. Click HERE to see all kinds of gorgeous parties with the Gold and Black theme. I went for a simple ensemble today. Easy to recreate but oh so fun to celebrate just one person at a table setting on their birthday. 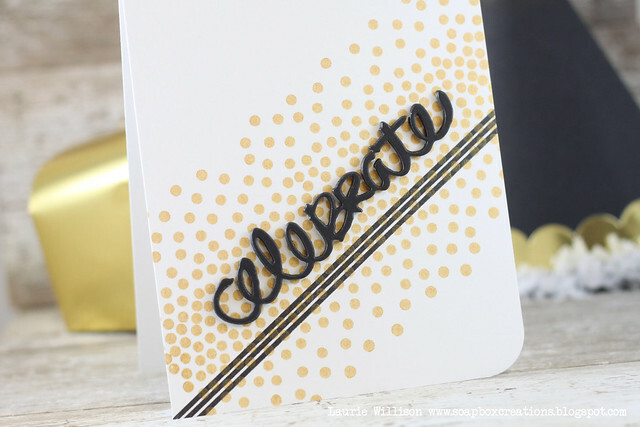 I stamped the dot border back to back in Gold Delicata ink. Then I added in a set of stripes from Background Basics: Super Stripes. 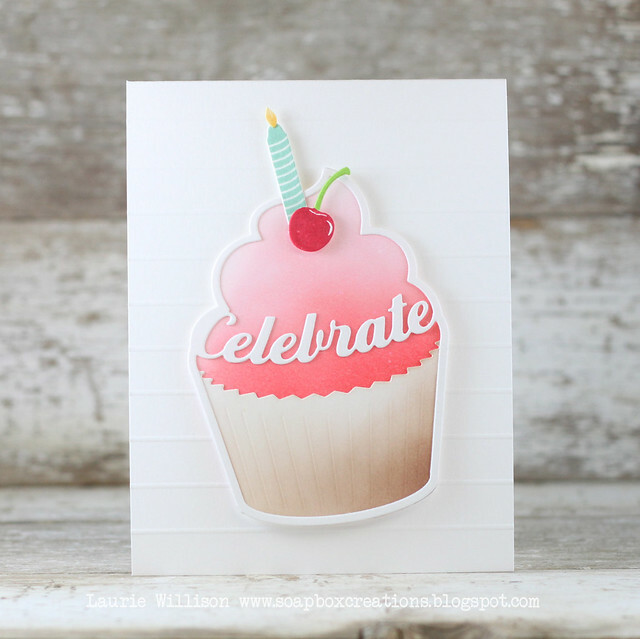 I die cut the word celebrate from the Good Times dies about 5 or 6 times and stacked them up for some dimension. I attached that to the middle of the border on the card. 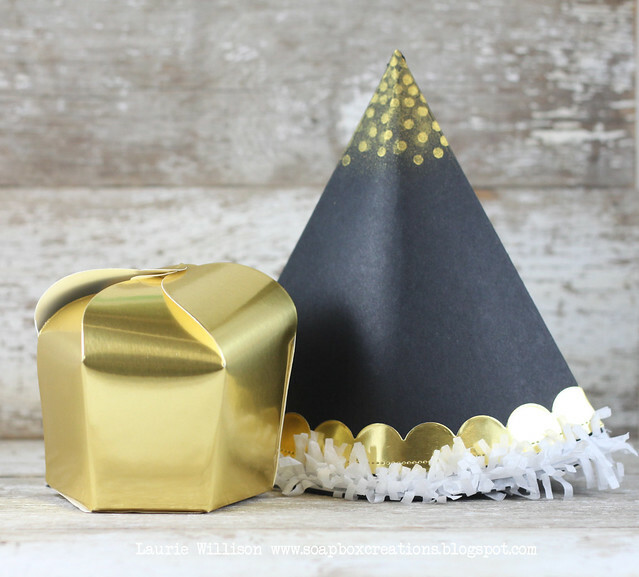 To match, I made a fun little party hat in black, adding in a gold adhesive scalloped border and some white tissue paper for the fridge. I used a sponge to blot on some gold ink and then stamped the dot border again on the top of the hat. I wanted a simple box that packed some punch, so I used another Gold Adhesive sheet, sticking it down to cardstock and then cutting it out with the Favor it: Cupcake Box. I love that shiny paper! I can't wait to see what the other girls have made up for today! Here is a list of their blogs so stop in and say hi! 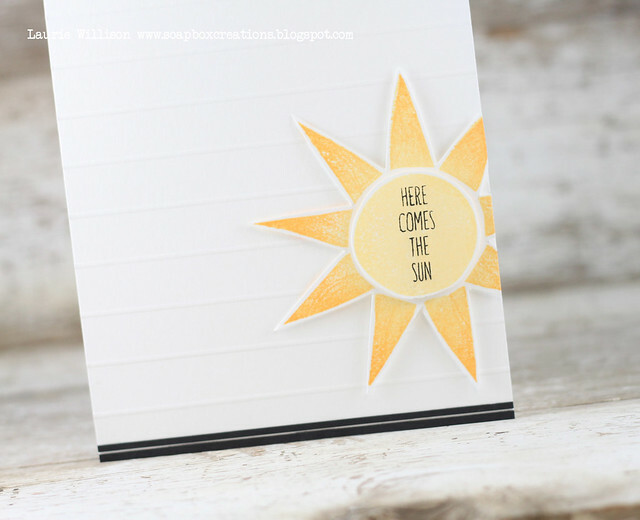 Welcome to the Simon Says Stamp Color of Fun Blog Hop. 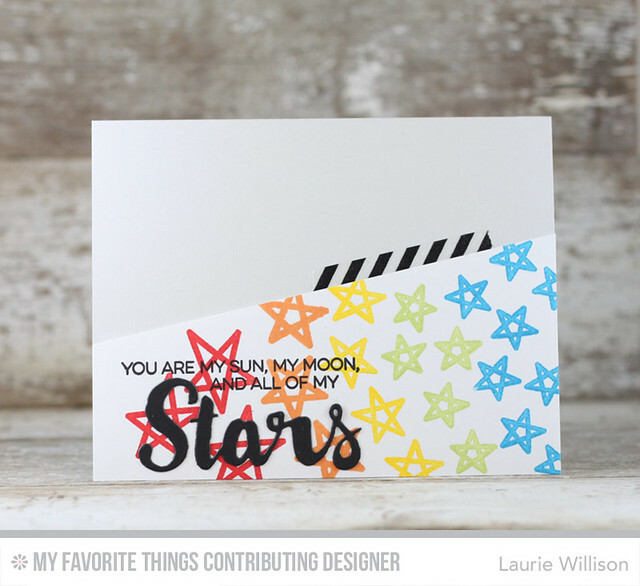 There are so many fun new stamps and dies to see today and I bet you have already seen a lot! You are almost to the end of the hop and if you are following along, you have hopped in from the very talented, Anna-Karin's blog. To see the full list of participants, stop on over to the Simon Says Blog. To see the entire Color of Fun Release, click HERE. I got overly excited about all the new goodies so I made 3 cards. This first one is my favorite. 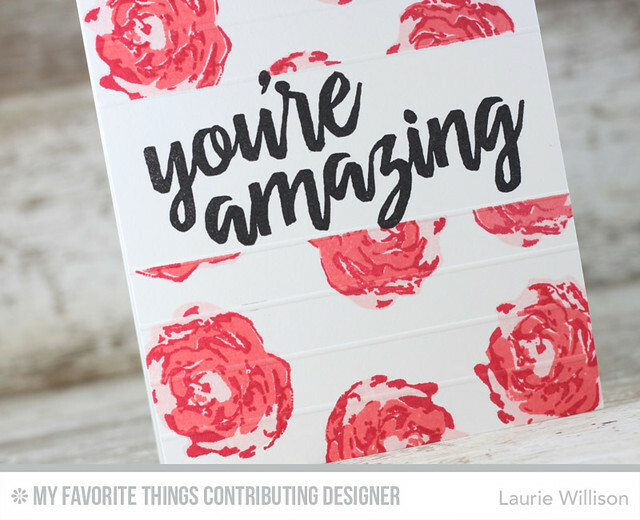 These gorgeous flowers and that sentiment are all from one new set called Many Thanks. 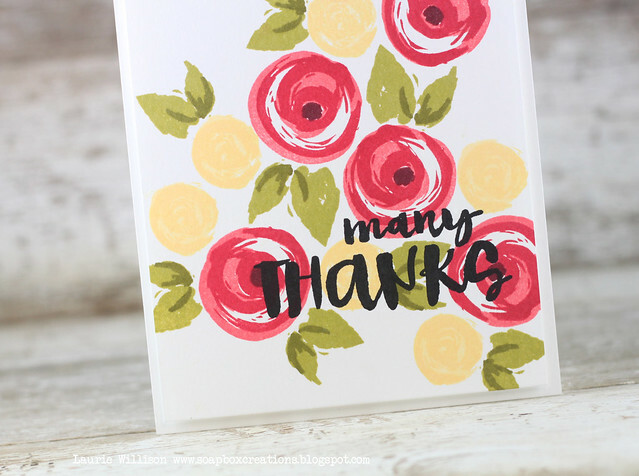 I stamped the flowers and leaves in a random pattern and then put the front card panel into my Misti. I stamped the sentiment in black and then stamped it 2 more times just so I could get a solid image. I popped that front panel up on a card base with foam tape to finish if off. My favorite thing to do on a card is score lines. If you look back, you can see I do this quite often. 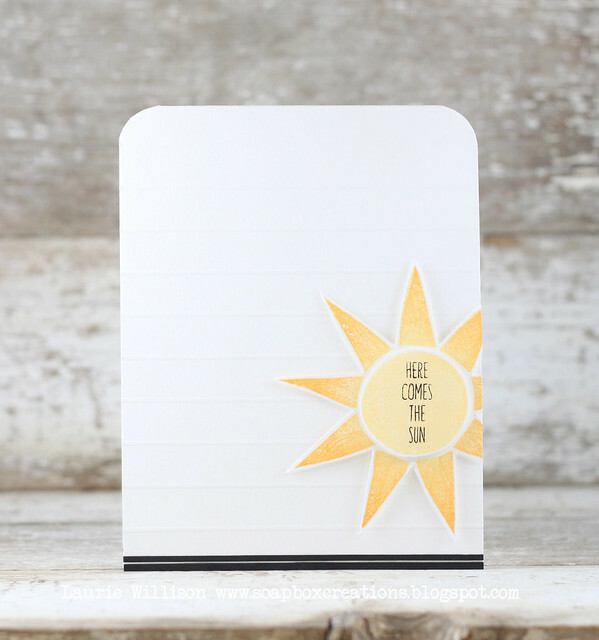 Such an easy way to add a little detail to a white card base. I stamped the sun in yellow and then sponged on a darker yellowish orange on the sun beams to give it a little scratchy texturey look. Is texturey a word? :) Then I popped the middle of the sun up after stamping the sentiment. I added in 2 thin strips of black card stock along the bottom of the card for some contrast. I use my Tim Holtz Blending Tool to sponge on a couple layers of color. The bottom color is Abandoned Coral and the top color is Spiced Marmalade. (All products are linked below). I used some Elmers spray adhesive and coated the back of the roller coaster and then attached it to the colored panel. I used the new Grunge Alphabet to stamp "hello" along the rail in black ink. I popped the panel up on foam tape and attached it to the card base. I hope you have enjoyed my cards today and am so glad you stopped in! Don't forget to leave a comment on each stop on the hop for multiple chances to win. Your next stop is my sweet friend, Yoosun Hur's blog! Have a great day!